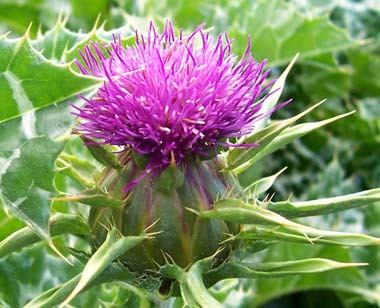 For over 2,000 years people around the world have enjoyed milk thistle in their diet. Just about all parts of the plant have been used as food with no reports of toxicity. Although it can be used as food, milk thistle is better known as having medicinal benefits. It is a great tonic, increases appetite and aids in digestion. It is used by many people, including those who were addicted to alcohol to cleanse the liver. Milk thistle is used internally in the treatment of liver and gall bladder diseases, jaundice, cirrhosis, hepatitis and poisoning (including mushroom poisoning). Distinguishing Features: Milk thistle is a stout, biennial or annual plant that grows up to one metre tall and has a branched, stem. This wild edible takes two years to complete the growing cycle. It is best known as having a unique shaped flower and leaves that are somewhat prickly to the touch if not careful. 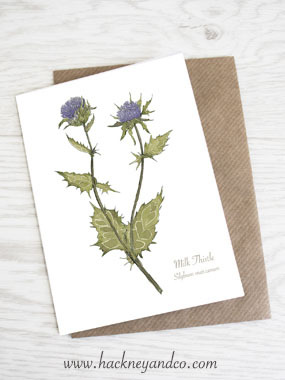 Each milk thistle flower can produce almost 200 seeds, with an average of 6,350 seeds per plant per year. Flowers: Milk thistle flower heads average between 4 and 12 cm. long and wide, and are light purple in colour. They flower from June to August in the northern hemisphere or December to February in the southern hemisphere (these grow in many countries). Fields of Nutrition has medicinal benefits and vitamin/mineral content of Milk Thistle. 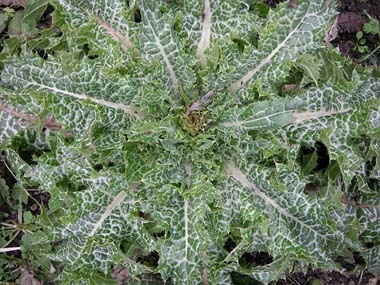 Leaves: The leaves of the milk thistle are oblong to lanceolate in shape. They are either lobate or pinnate, with spiny edges. Leaves are hairless, are alternate, and have milky-white veins. The upper leaves clasp the stem. Height: Milk thistle grows up to one metre tall. 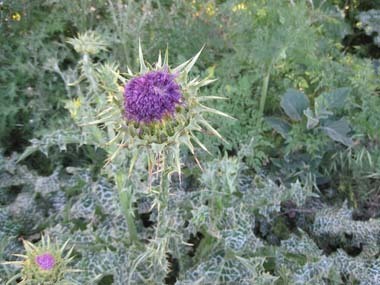 Habitat: Milk thistle grows in dry, rocky soils, preferring sunny or lightly shaded areas. It also likes waste places in many areas around the world. Edible parts: The young stalks, leaves, roots and flowers can be eaten. Milk thistle root can be eaten raw or cooked. Leaves can be eaten raw or cooked however the very sharp leaf-spines must be removed first. When cooked these leaves make a great spinach substitute. Flower buds can be cooked. The stems can be eaten raw or cooked. They are best when peeled and soaking is recommended to reduce the bitterness. 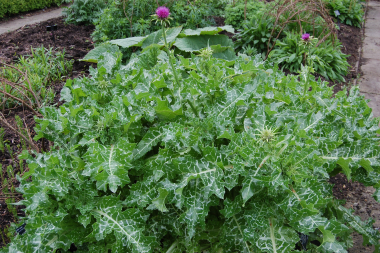 Milk thistle can be used like asparagus or rhubarb or added to salads. They are at their best when used in spring when they are young. Roasted milk thistle seeds can be used as coffee substitute.